About Energy Saving Products, Inc.
Our headquarters in Tualatin, Oregon. We were originally located in downtown Portland is what is now the Pearl District. In 1980, we moved to the Clackamas Industrial Park in Clackamas, Oregon. In 1993 we constructed our own facility with warehouse and office space in Tualatin, Oregon. We stock a full array of parts for Roberts-Gordon heaters, including parts for legacy heaters dating back to the 1960’s. We can normally ship the same day we receive the order. Having the equipment in stock, ready for your project is our priority. During construction, delays waiting for equipment, or items damaged in shipment can be costly. Our goal is to make sure your project goes smoothly. We stock MacroAir fans, blades, and controls. In most cases, we can ship the same day. We believe in the products we represent and heat our warehouse with CoRayVac infrared heating using UltraVac modulating controls. For summer comfort, we have a 14’ MacroAir AirVolution D-550 fan with digital control. Energy Saving Products, Inc. is a stocking distributor and manufacturer’s representative for infrared heating products, HVLS fans, and fume & exhaust capture equipment. Our territory includes Oregon, Washington, Idaho, and Alaska. Our office and warehouse are located at 10400 S.W. Tualatin Road in Tualatin, Oregon. This is at the north end of Teton Avenue where it “tees” into Tualatin Road. We are in the West end of the building. We have offices in the Seattle area and Spokane. Roth- Sirianni LLC is our sales partner in Alaska. 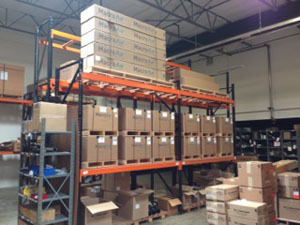 Why do we warehouse in the Portland area? Portland is centrally located in our territory of Oregon, Washington, Alaska, and Northern Idaho. Warehousing locally allows us to receive all of our products in truckload lots - damage free - and at a considerably lower freight cost than LTL shipments. We feel it is important to have equipment available close to where it’s installed. This reduces lead times and guarantees easy remedies if shortages occur. We are open from 7:00 AM to 5:00 PM (Pacific Time) Monday through Friday. We are closed evenings, weekends, and holidays. What is our company’s history? The business was founded as the Alvin R. Bravender Co. in 1938. Harold W. “Willie” Hansen purchased the firm from the Bravender Estate in 1971. The company continued as the Alvin R. Bravender until 1973 when Energy Saving Products was Incorporated and the name was changed. In 2002, ownership passed to Jerry Hansen who has been with the company since 1976. How long has the company been distributing infrared products? Energy Saving Products has been distributing the CoRayVac® systems since their inception in 1960. We’ve been distributing the Vantage® and GordonRay® unitary equipment since 1975. 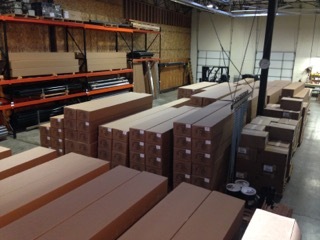 We have supplied infrared heating systems on over 3,000 individual installations in the Pacific Northwest and Alaska. They range in size from one unit to as many as 350 at one location. We’ve supplied another customer with CoRayVac® in 25 plants across the United States. We also designed a CoRayVac® installation in Korea. Our installations have ranged from as simple as one heater in a small shop to heating the Space Shuttle Hangar at Edwards AFB. What special services do we offer for our customers? We offer computerized heating design services for our products. These are on a no charge basis to Engineers, Architects, Owners, and Contractors. The specific services are: heatloss calculations, equipment layout (including electrical and gas piping), equipment takeoff and quotation, estimated installed costs, and estimated operating costs. We also provide information and assist in completing application forms for incentives and tax credits available for infrared heating and heat recovery projects. What is the turn-around time on these services? Most of the year it is within one day or two on large projects. In the busy season of September through March it may take a little longer. Small jobs with unitary equipment can nearly be done on the phone or by email. For fastest response, plans can be emailed to us in DWG, DXF, or VersaCad format at plans@esp-nw.com. It is our responsibility to provide service to the Architect and Engineer to get our products specified. We help contractors present our products to end-users. 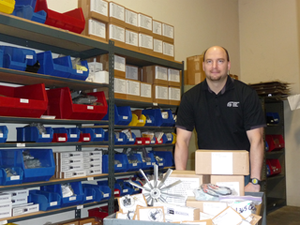 We provide parts for all of the equipment we have sold, stocking them in our Tualatin warehouse. We believe that anyone in the distribution chain should perform useful functions for their customers or they should not be in the business. We have the equipment in stock. We offer a choice of different grades of equipment to meet all of the needs of the marketplace. We help the contractor get the equipment installed corectly. We help with equipment fire-off to insure your customer gets what they paid for. We have backup service parts and service help for the contractor. Customer satisfaction is what our long-term success depends on. We expect our equipment to be installed and serviced by licensed mechanical contractors, HVAC contractors, and multifaceted firms that have all the capabilities for completing a turnkey heating system.